Thief is a 1981 neo-noir crime film written and directed by Michael Mann and based on the novel The Home Invaders by "Frank Hohimer" (the pen name of real-life jewel thief John Seybold). The film's cast includes James Caan, Tuesday Weld, James Belushi, Robert Prosky and Willie Nelson. Frank is an expert jewel thief and hard-boiled ex-convict with a set structure to his life. With a pair of successful Chicago businesses (a bar and a car dealership) as fronts for his very lucrative criminal enterprise, Frank sets out to fulfill the missing part of his dream: a family beginning with Jessie, a cashier he has begun seeing. After taking down a major score, Frank's fence is murdered. He finds out that the man responsible is a Mr. Attaglia, a shady plating company executive for whom the fence was working. Attaglia is in possession of money that belongs to Frank, who demands it back. This leads to a face-to-face meeting with Attaglia's employer, Leo, a high-level fence and Chicago Outfit boss, who wants Frank to work for him, offering him "boxcar" profits. Above left: Frank, an expert jewel thief. Above right: Leo, a high-level fence and Chicago Outfit boss. Frank is reluctant at first, but wanting to make his dream come to fruition faster, he agrees to do just one job. Soon he is taking part in a large-scale West Coast diamond heist. With a little help from the paternal Leo, he is even able to purchase a baby on the black market, a son he names after his closest friend from prison, Okla (whose real name is David). It all seems too good to be true. Frank's big payday finally comes, only for Leo to renege. An irate Frank demands his money in 24 hours or there will be consequences. Frank drives to his car lot to meet with his friend and associate Barry, unaware that Leo's henchmen are waiting for him. Frank is knocked unconscious and Barry is shot to death. Frank awakens with Leo staring down at him, surrounded by his henchmen. Leo coldly informs Frank that he, Jessie, their child, and everything Frank owns are Leo's property. Above left: Jessie, Frank's love interest. Above right: Barry, Frank's associate. Leo even threatens to prostitute Jessie and kill Frank's family if Frank does not continue in his work for him. Leo tells Frank to "tighten up" and focus on his responsibilities; meanwhile, his henchmen eliminate Barry's body. Frank goes home and orders Jessie out, saying their marriage is over. He has an associate drive her and the baby somewhere where they cannot be found. With nothing to lose, Frank blows up their house. He proceeds to drive around doing the same to his business establishments. He then breaks into Leo's house, beating up Attaglia and shooting Leo to death. As Frank walks outside, he is confronted by Attaglia and another of Leo's men. A gunfight ensues. The final scene is of a wounded Frank walking away into the night. 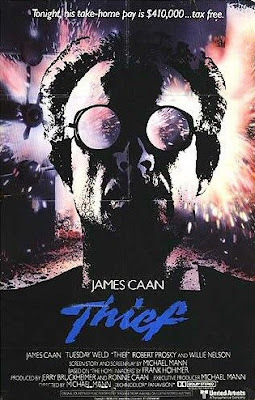 a. Poster for Thief: The poster art copyright is believed to belong to the distributor of the film, United Artists, or the publisher or creator of the film. b. Wikipedia, 'Thief (film)'. Web, n.d. URL = http://en.wikipedia.org/wiki/Thief_(film).